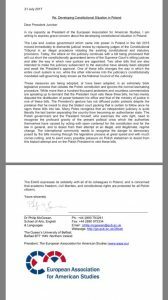 In my capacity as President of the European Association for American Studies, I have today written to the President of the European Commission, Jean-Claude Juncker, and to the Foreign Minister of Ireland, to express grave concern about the developing constitutional situation in Poland. The Law and Justice government which came into power in Poland in the fall 2015 moved immediately to dismantle judicial review by replacing judges of the Constitutional Tribunal in an illegal procedure violating the existing constitutional and statutory provisions. Today, the attack on the judiciary continues with a bill being processed that will cut short the constitutionally guaranteed terms of the Supreme Court’s sitting justices and alter the way in which new justices are appointed. Two other bills that are also intended to make the judiciary subservient to the executive have already been adopted and await the President’s approval. One of these bills changes the way in which the entire court system is run, while the other intervenes into the judiciary’s constitutionally mandated self-governing body known as the National Council of the Judiciary. These measures are being adopted in an extremely brisk legislative process that violates the Polish constitution and ignores the normal lawmaking procedure. While more than a hundred thousand protesters and countless commentators are speaking up to demand that the President must veto these three bills, he has merely disputed the distribution of power between his office and that of the ministry of justice in one of these bills. The President’s gesture has not diffused public protests despite the pretense that he meant to stop the blatant court packing that is certain to follow once he signs these bills into law. Many Poles recognise that an independent judiciary is quite literally the last barrier separating the country from becoming an authoritarian state. The Polish government and the President himself, who exercises the veto right, need to recognise the profound gravity of the present political crisis which the authorities themselves have caused by acting with open contempt for the constitution and for the law in general, and to desist from their attempt at an illegal, and illegitimate, regime change. The international community needs to recognise the danger to democracy posed by the bills moving through the legislative process at great speed and with much corner-cutting, and to exert every possible pressure on Polish statesmen to desist from this blatant attempt and on the Polish President to veto these bills. The EAAS expresses its solidarity with all of its colleagues in Poland, and is concerned that academic freedom, civil liberties, and constitutional rights are protected for all Polish citizens.